VISION BOARDS ARE SO MUCH FUN!!! When I went to see my oncologist for an appointment she told me that the Cancer Center where I go for treatment was having a Vision Board program and she would like me to come. I asked what that was. My sister was with me and they both explained that I should bring pictures along and put them on the board. I went to the program with several pictures from my traveling, of my precious hearing ear dog who was with me, and of my books. I even slipped in a picture of my oncologist, who has been my role model for 9 years and kept me alive. About 25 people gathered including staff, my oncologist and her husband, cancer survivors and families including children. There was a long table of clip art and a pile of magazines. They showed us a video and asked us to begin. We were to visualize our goals. I had no idea where to start, but did not want to sit there looking stupid. Everyone else looked like they knew what they were doing and was busy. As I looked at my items I realized that I wanted to do more writing, take more cruises and spend more time with my hearing ear dog. The board actually evolved and I was thrilled with the results. I then printed out the slogan “Write” and “Travel” and “Dream.” I looked at the table and saw the “Best Self.” These would make me be my best self. I then placed the picture of my oncologist on the Glacier Bay picture from Alaska, since she also enjoys traveling. If you Google “.Vision Boards,” there are lots of articles and videos. This is a worthwhile activity I would advise anyone to try. Ideas can range from self improvement, to health and fitness, to home improvement and a plethora of other goals and dreams. My wise oncologist, Dr. Trehan and the great staff at Aultman Hospital Cancer Center realized something important. The visual boards gave all of us cancer survivors an important emotion - HOPE! Try it and enjoy! You will be glad you did! UPDATE AND WHY YOU HAVE NOT HEARD FROM ME! I am aware that I have not posted for awhile. It has been a crazy time for me. A few weeks ago I got a nasty sinus infection, which mostly caused severe headaches. I was concerned because I am on Procrit shots, which can cause blood clots. I was on a couple rounds of antibiotics. When I went off, I noticed tooth pain. I went to the dentist and was concerned it was another root canal. It was far worse – two cracked teeth down to the roots so no root canal could be done. I went a week later to the oral surgeon and had them pulled. It was not a fun experience. Now with the cancer the big question remains whether implants will work. The oral surgeon is saying one thing and my regular dentist, who is great and has known me for over 25 years, thinks they won’t work. I asked the surgeon to talk to my oncologist. Those of us with cancer truly have to be on top of it all – and we get tired don’t we? But Friday I got very good news. Audrey Hassan, editor, researcher and friend of all of us called me from the MDS Foundation. She asked if I would be OK with having the article I wrote several weeks ago published in the e-news next month and the print copy in the fall. I stammered that I did not think the article was that good while she said “Are you kidding?” I tend to not be as confident about my writing – or anything else – as I could be, but am thrilled! Meanwhile – I am on chapter 63 of the book I am writing on Growing up Deaf. There is so much to tell and I have no idea when I will finish, but I feel deep down this is my best book yet. I can see how many people it will help including deaf/hard of hearing/parents/children/teachers/interpreters/friends of the deaf and so many more! Sita and I have been outside some which is wonderful. We go to the nearest coffee shops and she loves to sniff the air while I write. I am getting great messages from many of you and please do keep them coming! More later and love to all my readers! SITA AND I DID ANOTHER PROGRAM TODAY!!! Sita and I had a wonderful experience today. A woman from my church is a member of Eastern Star. She arranged for Sita and me to do a program on service dogs because Eastern Star is sponsoring a project now There were over 175 in attendance. I spoke from the heart and told them what Sita means to me. She was out of vest afterwards and charming everyone. They had a table with stuffed dogs and made up stories about service dogs. Cathy did not have to make hers up - she told the true story about Sita! I autographed books afterwards. I am thrilled that more and more people are learning about the wonderful tasks service dogs can do for us! SITA AND I ARE ON THE PROGRAM CIRCUIT AGAIN! I was a college teacher at three different universities for over 35 years. My first job was at Walsh College (now university) in 1086. I am so happy to be back at Walsh doing this program for Disabilities Week talking about Sita. Life does go full circle! Kudos to the wonderful office of Disabilities Services under the great leadership of Meredith Soduk for sponsoring this week to educate faculty and students. I WAS FEATURED IN AN ARTICLE IN THE CANTON REPOSITORY! SURPRISE - KEYNOTE SPEAKER AT CIRCLE TAIL!!! Circle Tail, the agency where I received Sita annually does a wonderful “Wine and Canine” benefit. They have great wine, a delicious dinner. and wonderful raffles, baskets, raise your paw donations and silent auctions. This is their biggest fundraiser. Jen Kiblinger, president and Marlys Staley, director, spend a year planning this event along with over 100 volunteers.. I had suggested to them that they have the human and canine partners speak. But the people there did not want their dogs to be presented so late at night (8 PM). They were in a great video. However, I was the only live speaker - thus the keynote! It was very hard not to have Sita there. However, the long drive from my house to my friend Ruth Fischer, would be tough on her. Also the dinner itself was 5 hours long. So I decided to have her stay with great friends and went without her.. I told my wise friend, Ruth, I was nervous and she reminded me that I did not have Sita with me. She went along with me and was a tremendous support. She was right - Sita is so cute that if I fouled up, I knew she stole the show! I really put my heart and soul into describing all the tasks she does for me including both heartwarming and funny stories. The audience was extremely attentive. I took my books to be donated to Circle Tail. All of the books “Paw prints on my soul” were gone and several copies of “Here to Bump and Bump to Hear.” Even my book on cancer, “Life is short - eat the donut” had several fans. I left some copies to be sold in Circle Tail’s store. It was wonderful to help out and I loved this dinner. I know they raised a lot of money for this great cause. And yes - Sita was thrilled to see me when I got home!. Last evening I had the pleasure of hearing Delia Owens speak at Book a Million in North Canton, Ohio. She was wonderful. She had written 3 nonfiction books and “Where the Crawdads Sing” was her first fiction book which sailed to the New York Times Best seller list. When asked which was easier to write I loved her answer. She explained that non fiction was more factual and like being in a cage. Fiction meant you were out of the cage and could take the book anywhere you wanted to go! This book is now being made into a movie. She is also working on a new fiction book. She lived for 23 years in remote Africa and had many stories to tell including how she was charged by lions and elephants, but dreaded public speaking even moire! I love hearing the different authors speak. I have over 40 chapters written for my non fiction book and am still writing away. I am being deterred by income tax which is not nearly as much fun! Also - the international Myelodysplasia Foundation has written and asked me to write an article for them on my journey with MDS to be published in their next newsletter. I am busy and happy. My health took a little downturn when my blood counts went haywire but I started some shots to get the red cells going which are working very well. So life is good! More later - another book signing coming up soon! AN AMAZING AUTHOR - DELIA OWENS IS COMING TO NORTH CANTON!!! As many of you know, I love to listen to other authors speak and it helps me with my own writing. I am so pleased that Books a Million at the Strip in North Canton, Ohio, is featuring Delia Owens on February 20th, 2019 from 6-8 PM. My book club really is fantastic and forces me to read books outside of my comfort zone. Our selection for February was Delia Owen’s book “Where the Crawdads Sing.” I knew nothing about this author except her book was number 1 bestseller on the New York Times Bestseller list! Any reader would find something wonderful about this book. Her description is unbelievable. She and her husband lived in Africa for many years and the story is about a young girl called the “Marsh Girl” who was forced to live on her own after being deserted by her family. The author takes you away to the marshes in North Carolina and teaches you so much about wildlife. The characterization is incredible and you feel like you know the people in the book. Finally there is an intriguing mystery when someone is killed and a twist at the end of the book that will keep you gasping. If you have a chance to read this book - please do it. And know how fortunate we are to have her in our back yard! There is a charge but you receive her book! If you cannot go, I will be following up after I hear her program! Contact BAM for more details! PLEASE HELP CIRCLE TAIL BY FOSTERING PUPPIES!!! Many of you have met Sita and read about her on Facebook. Several of you have read my recent book Paw prints on my soul: Lessons of a service dog. You therefore know how this amazing dog opened up a whole new world to me of sounds I never knew were out there and how she keeps me safe. I received Sita from a wonderful agency called Circle Tail near Cincinnati. For over 20 years under the direction of the great Dog Whisperer, Marlys Staley, this agency has managed to partner people with mobility issues, hearing problems and diabetes and other physical problems with the perfect dog companion for them. Presently they are breeding and whelping dogs on the grounds and need your help. Circle Tail would like to expand their services further north. They have several adorable and engaging puppies that need to be socialized and trained. Basic training is done by women handlers in two prisons, but the dogs need to learn how to interact with families and socially. They are looking for foster parents to take the dogs. You are allowed two other dogs, cats and children. You would have to travel some to Circle Tail, but much of the training would be done in the northeast area. The dogs are between the ages of 6 months to two years. Another person, Kim Wallick, who has a daughter with mobility issues and received a wonderful dog from Circle Tail, has agreed along with me to help out locally when needed. Veterinarian bills and dog food costs will be covered. Kim and I also have brochures we can deliver or mail to you. Contact us on Facebook. Thank you for helping others as we have been helped. Everyone is so busy after the holidays and now I am catching my breath. I just wanted to update everyone! Sita is just amazing. Right before Christmas, a private school in Akron named SCOPE contacted me and invited me to speak. Upon finding it would not be a long walk and a short program I decided to take Sita. I was promised around 22 students. kindergarten and first grade. After mentioning Circle Tail the teacher told me that the students handmade some doggy treats and sold them. The profits would go to them. I was thrilled and off we went. That dog was wonderful. Since it is so hard for her now with arthritis to get up and down I only had her show them a couple of things she does for me like picking up my keys and bumping me when someone knocks. I talked about what service dogs do and specifically the training at Circle Tail. I then had her lie on the floor and every single child go to go through and pet her. And there were more than 22 kids but that is OK! Teachers were peeking in too! She was so patient and good. The kids mentioned how soft she was. They had many good questions! When we were done the teacher told me they had collected over 100 dollars and sent the money to Circle Tail., I was surprised but they worked hard at it. I also left my first book - Here to Bump and Bump to Hear with the classroom.I also thanked the phenomenal teacher who organized everything. So because of my beautiful dog, Circle Tail got a much needed donation right before Christmas and the children learned the pleasure of giving. MEETING LOUISE PENNY IN PERSON!!! Earlier in one of my blogs I talked about how excited I was to hear Louise Penny in person! I e-mailed ahead to ask for front seats for my friend Edlyn Theiss and me, because there were almost 500 people and I knew I would not be able to hear. The Cuyahoga County Library System is one of the best in the country and they were amazing! They had a loop ready for me to use with my hearing aids and took me right down to the front row center in front of Louise. Because I made the reservations early, I was one of 100 people asked to stay and get my book personalized! She had autographed a book with her name for every person there. When I reached her, a library employee offered to take my picture. I whispered in her ear that I was the one writing articles based on her book for Cure Today. She knew all about it! When I got home and looked at my book she had put “thank you for your kindness!” I cried and was so happy! She is not only a fantastic author but a class act. I also made the number one of all the articles published in Cure Today for November - see the video on the video page. Finally I heard from Cure that they are considering one of my articles for a print version which goes to every oncologist’s office in the country - more on that later. I am struggling as a new writer and all of these events encourage me so much! Thank you all for your support and following my journey with me! 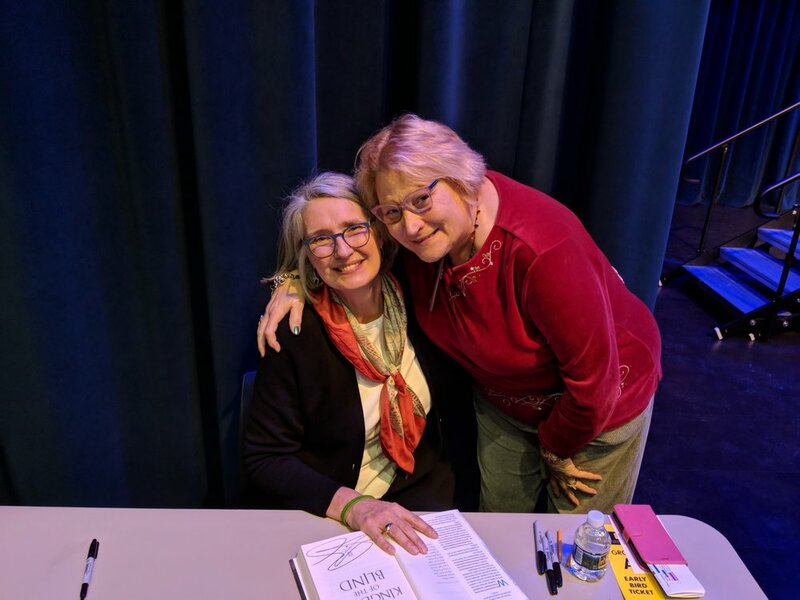 LOUISE PENNY AND ME! SHE IS AUTOGRAPHING MY BOOK!!! I have truly found I enjoy writing and it is almost like breathing to me. Much as I love to socialize and get out with people, I really enjoy just writing and putting down my thoughts. I also love hearing other authors speak! What I did not expect was to get ideas for the blogs I write on a regular basis for Cure Today magazine. This informative and well - known magazine welcomes contributions from people who have cancer and stories of their cancer journey. The first book Still Lives inspired me to write the blog Still Lives and Cancer. The second book Fatal Grace inspired me to write an article titled Shining through the Cracks of Cancer. I am presently reading the third book and am sure I will get some more ideas! Both articles are here on the website. I have contacted Louise Penny and she has an employee from Scotland (I love the global aspect) who responds to the e-mails and has assured me that Louise enjoys the articles. Imagine how wonderful it will be to meet her! While on the subject of writing, I need to write down my articles in pen before I type them up. I know some authors tell me they do everything on a laptop - it is just a difference in style. But somehow the transfer from the brain to the pen to the typing helps me. There has been a new Starbucks opened near my apartment. I go there several times a week to write with my wonderful hearing ear dog partner, Sita. The staff loves her and gives her a “pup cup” cup full of whipped cream. Here she is just sitting and watching me and the other people while I write away. It just doesn’t get any better than this! I hope all of you have a wonderful Thanksgiving! Be grateful - we all have so much to be grateful for and need a day to remember that. But it is also something we should remember all year! Blessings to all! MY FAVORITE STORY ABOUT SITA!!! Yesterday I was asked to attend an Author’s Fair at the Massillon Public Library. I had been there the year before and enjoyed it. This was a great chance to mingle with other authors, hear them talk about their writing journey and buy some books! Plus we had great refreshments! I was asked to speak first. I showcased all three of my books but the favorite story came from Paw prints on my soul: Lessons of a service dog. Sita is one of the most sensitive and intelligent dogs I have ever seen. For 7 years she went with me to appointments in the private practice where I worked as a Professional Clinical Counselor. I have many stories about how her gentle nature impacted my clients but my favorite story is this one. I was sitting on a chair facing my client who was on the couch talking to me. Neither one of us was paying any attention to Sita, who appeared to be asleep under my desk. My client was sobbing as she described her terrible childhood. Suddenly Sita came out from underneath the desk. She reached on the top and pulled a tissue out of the box lying there. Then, she trotted over and handed the tissue to my client with her mouth. My mouth dropped to the floor in amazement. My client started laughing and said “Sita you just made my day! “ I chuckled and told her that she should pay Sita and not me for the session! But the wonderful thing about this was that she had never been taught to do this. She had been observing me and knew that when someone cried I handed them a tissue. So she did my job for me. What a fantastic dog! If people would spend more time observing and less time talking think what we could accomplish! This and other heartwarming stories are available in my book.